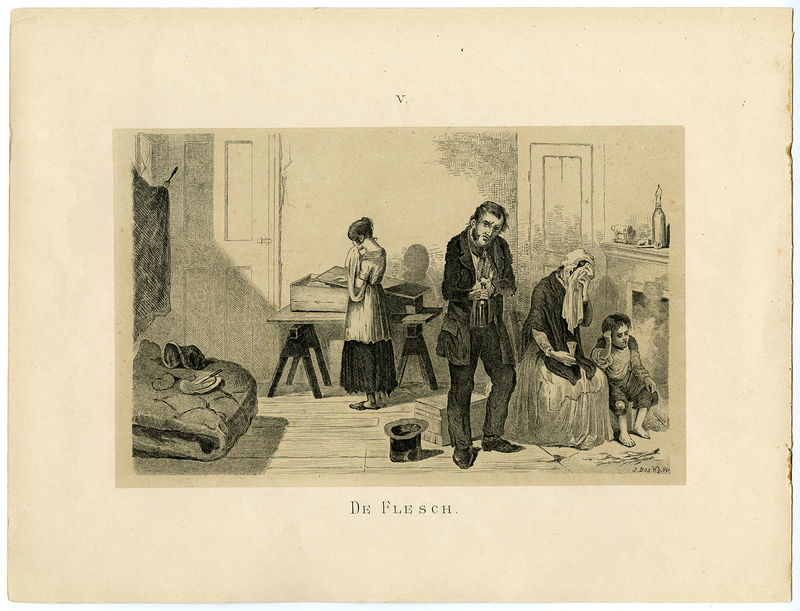 Subject: Antique print, titled: 'De Flesch, V' - A late 19th century satirical/moralising scene. A man and his family are mourning because of the death of one of his children, the child died of hunger as aresult of his drinking problem. Condition: Good, given age. Small rust stains in the right margin (from staple binding). General age-related toning and/or occasional minor defects from handling. Please study scan carefully. Size (in cm): The overall size is ca. 35 x 26.5 cm. The image size is ca. 25.5 x 17.5 cm. Size (in inch): The overall size is ca. 13.8 x 10.4 inch. The image size is ca. 10 x 6.9 inch.